Today the group split into two groups. 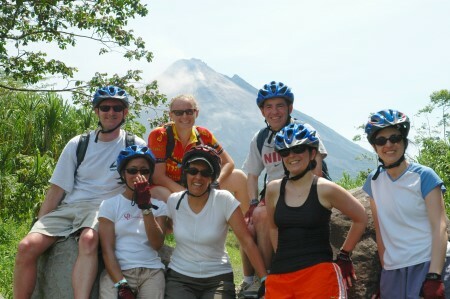 Most of the group went on a volcano hike, while I and a few others chose to go mountain biking around the volcano. The road we took turned out to be quite challenging with many twists and turns and steep inclines and descents over a very rough gravel surface in a very warm and humid environment. 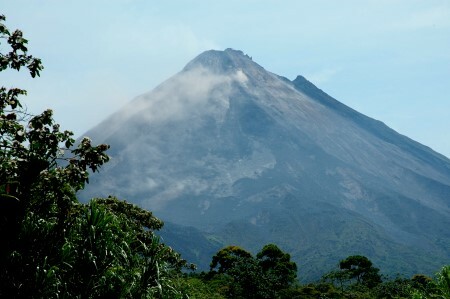 Along the way we had great views of the Arenal Volcano. As we looked at the volcano we could see huge lava boulders rolling down the side of the volcano leaving a trail of steam in its wake. Adam, who does most of his biking in the mountains of Colorado was definitely the biking king of the group and took the lead with ease. Luckily only one person fell from their bike near the end of the ride and fortunately received only minor scrapes. With the challenge of the road I was very surprised that more people didn't fall. Just before diner we held Shabbat services by torch light near the resort's swimming pool. The torches were a nice affect, but it made it a little difficult to see. Once services concluded we headed over to the buffet for diner.